1. We can sense the contrast between Herod, king of the Jews, and the child in the manger, King of all nations. Herod sought to preserve his kingship through violence, power and wealth while the child Jesus possessed none of these things. The wise men from other nations came to do homage to Christ while Herod intended to murder Him. In fact, the only time Christ was given the title ‘King of the Jews’ was while He hung upon the cross. The kingship of earthly rulers is limited, temporary and usually only preserved by force. Christ’s kingship is seen from the beginning to be universal, eternal and a reign which brings peace. 2. It is fitting that a star should lead the gentiles to Christ. A star brightens the night and can be seen by all. The stars have also been used for centuries to guide travellers on their way. Christ came among us as a light in our darkness breaking up the night of sin. He came not only for one nation or people but like the stars in the sky He shines for everyone. The light of Christ’s truth is a sure guide for all of us as we travel our pilgrim way. The most important star in our skies is the sun which is the source of all physical life and energy. Christ is as fundamental to our lives as that star which we call the sun. With His birth a new age dawned. 3. The Magi on behalf of all nations bring gifts for the child; gold for the King, myrrh for the anointing at His death and frankincense for the Godhead. The child returns the gifts. The King came not to be served but to serve. His death became a ransom for the life of His subjects. Our God became man that we might become children of God. God’s plan of salvation is seen already in the stable in Bethlehem. 1. The first miracle recounted in John’s Gospel is in the context of a marriage. In this way John presents Christ’s love for the Church as a relationship of bridegroom to bride,. When finally His Hour” comes the Church is born from His side in blood and water just as Eve was born from the side of Adam. It is impossible to say that the Church is merely a human institution, set up by early Christian leaders and not originally willed by Christ. 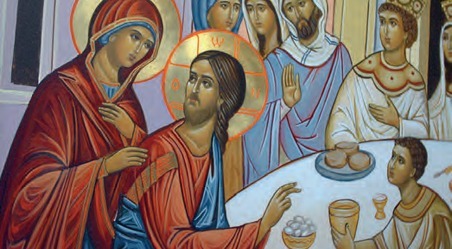 The parables of the wedding feast and the poetic “marriage of the Lamb” in Apocalypse are more than illustrative stories: they tell of heavenly realities. The culmination of the life of the Church will be the eternal marriage in heaven. 2. Christ chooses married love to be the sign of the sacrament which communicates to the world His love for the Church. Since Christ’s love is total, faithful and never-ending, so the union of Christian couples requires total self-giving, fidelity and indissolubility. This may seem impossible today, but the grace of the sacrament transforms the ‘water’ of human love into the ‘wine’ of love, confirmed and strengthened by Christ. 3. Mary is the great model for all members of the Church. She shows great confidence in Jesus; childlike trust; does not ask in detail but points out the need; then waits confidently for God to act. The glory is rightly given to Christ as Mary fades into the background. In John’s Gospel she does not reappear until Jesus meets the Cross; an example for all Christians. 1. In the verses 1, 1-4 we find the reason this Gospel was written: to present an ordered account of what happened, as seen by the eye-witnesses. It is important to know that our fait in Jesus’ life and works is based on fact. We do not call upon fables and fairy-tales, stories conjured up to give cult status to a man from Nazareth. Our faith is in one who lived a truly human life and, through that life, communicated the fact that He was God in person. This is the foundation of the teaching we have received and believe. 2. Jesus reads the prophecy of Isaiah. In every line we recognize the prophecy is being fulfilled in His life. He is God’s chosen, anointed one, who brings hope to the poor, freedom to the slaves of sin, enlightenment through His teaching and example, and raises those weighed down by the cares and difficulties of the world. Jesus clearly claims to be the Messiah and the one who brings God’s favour. The rest of Luke’s Gospel bears this out in concrete events and experiences. 3. “This text is being fulfilled today…” The Lord’s Year of favour has not ended. The Church, as Christ’s body, continues His work through all the centuries. She brings freedom, comfort and strength in the sacraments and ‘good news’ and enlightenment in Her teachings. Christ’s reputation spread through the country-side as people heard Him teach and experienced His healing. We must spread this reputation today as His teaching and healing can still be received. 1. Following immediately on last week’s Gospel, we hear today of the reaction of the listeners. We can see the irony in their question: “This isJoseph’s son, surely?” Luke himself in 1, 34-35 tells us otherwise. Jesus’ words and actions are readily received by the crowds, but they cannot accept the claims He makes about Himself. Most of Christ’s teachings are accepted as ‘values and ideals’, as He is recognised as a ‘good and holy man’. But, unless we believe in Him as the Son of God and strive to follow His ‘message of eternal life’, then our rejection of Him is the same as the crowds’ who wished to stone Him and Pilot who crucified him. 2. The woman from Sidon shared her last meal with Elijah and was rewarded with food until the famine ended. Naaman the leper obeyed Elisha’s order to wash in the Jordan and was rewarded with healing., Neither was a Jew. None of us can make claims on God’s favour by calling on our family background or membership of a race, nation or Church. Brothers and sisters of Christ are those who hear His word and put it into practice. Love of God, shown in our obedience to His commands, and love of neighbour, shown in our service and generosity, are the greatest commandments. 3. We cannot accept Christ on our terms. Some parts of the Gospel accuse and condemn us. Either we recognise our fault and try to change or we put ourselves above Christ and are ‘enraged’ by His words. To change is hard; but to live without Him is impossible. 1. Jesus used Simon’s boat in order better to preach to the crowds. We see how Christ wants our cooperation in His work. He is happy to ask for your help, or even, not ask but take out help. No matter what we do in life, there is always something God can use. The first duty and ministry of a lay-person is to bring Christ into the home and place of work. No action, however small, is useless or insignificant - when offered to God everything can be a prayer, and no occasion is lost quietly to witness to Christ. He depends on us to be His hands, His mouth, His smile and His word of compassion and encouragement. 2. Peter could easily have said “I know best”. 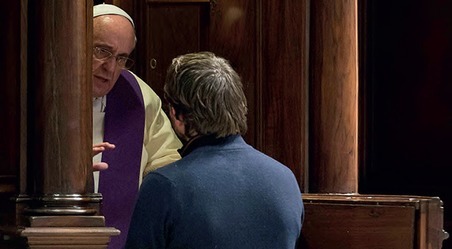 But he obeys Christ: “If you say so, I will…” This is true faith and trust, and is a great example to us in the twentieth century who have become so arrogant and self-assured. Peter is greatly rewarded with a tremendous catch. James and John are also called onto the scene. Service and enthusiasm in our faith is infectious. Never underestimate your silent influence on others through your open love and joy in your faith. 3. Peter’s reaction to Christ coming close to him is natural: he is overwhelmed by a feeling of unworthiness. Christ heals the sin and encourages us. When we are persuaded not to serve Christ because we feel unfit for His Work we must recognise this is the Devil speaking. Of course we are not worthy - but Christ calls us and by His grace of forgiveness transforms us into His instruments. 1. There are great crowds from all parts following Jesus, but He “fixes His eyes on His disciples”. This teaching is for His true followers - those who will have to stand apart from the crowd and be counted…and persecuted. 2. The world says: blessed the rich, the satisfied, the happy and the famous. Yet all these things are open to the rust and moths of corruption; to think they will last forever is a terrible mistake. When they fade away only tears and emptiness areleft for those who built their lives on them. Instead, those who suffer in this world, especially those who suffer for Christ, build their lives on an eternal foundation. The truth and love of God never fade and are the essence of His kingdom. 3. The prophets are presented as the examples to follow. They gave their lives to bringing God’s word to the people. We like them, must listen for God’s Word in prayer and the Gospels, and carry His word in our life-style. We must show courage and expect the same treatment they received - but we too can hope for the same reward. 4. If we want proof that these promises will come true we need only look at Christ. He was poor, went hungry, wept, and was denounced as a criminal. After three days in the tomb He inherited the kingdom of God. We too will be heirs if we show ourselves to be His brothers by imitating His life. 1. Jesus addresses these instructions to “you who are listening”. Only those willing to learn from Jesus will begin to understand. These teachings are so opposed to our natural inclinations. We often use the excuse “I’m only human” or “I can’t help it, it’s my character”. In fact fallen human nature is ‘sub-human’ and it is our ‘lack of character’ which causes our failings. What our Lord asks is that we reverse this inclinations, and by cooperating with His grace and listening to His teachings that we rise above the ‘sub-human’ and reform our character. 2. Often we do good to others out of personal interest, expecting something in return. To love an enemy and give without hope of repayment is to sacrifice something of oneself. Sacrifice is at the heart of Christianity and is an essential ingredient. Sin entered the world through grasping at something which is not ours: “to be like God” (Gen3,5). Sin will only be banished from our lives if we give - give of our very selves. 3. All through the Bible the mercy of God is constantly told. Christ’s whole life was one of compassion and mercy. He asks us to be merciful to. If we are honest we recognize that the justice of God is bound to condemn us for our many sins - but God’s mercy gives us hope. The phrase “Do not judge and you will not be judged yourselves” should be constantly in our minds: perhaps it is the only chance many of us have of reaching heaven. 1. Before Jesus starts his preaching, he goes into the desert and imitates the people of Israel who left the slavery of Egypt and wandered in the wilderness. While in the wilderness, the people received the commandments, were sustained by God with water from the rock and manna from the dust, and finally brought to the promised land. In order that we might leave slavery to sin, we must enter into the desert through fasting and abstinence and discover how Jesus gives Himself as our water of life and bread from heaven, how He is the way to eternal life. 2. The three temptations some up the temptations we face as we go through life. When young we are tempted to give way to our inordinate desires. When middle-aged we crave for power. When old we seek notoriety and attention. Lent is a time of special effort and grace when we deny ourselves: we try to go hungry, to act with humility, to put others first. Christ answered the Devil with words from Scripture. We must give more time and effort to prayer if we too are to succeed.